It's unlikely that you’ll encounter completely raw cashews. The so-called raw cashews sold in natural food stores are actually steamed. The double shell surrounding the raw cashew contains urushiol that can create significant skin rashes. Processing raw cashews can be a nightmarish ordeal, and people who undertake this job develop allergies over time. But steamed cashews are safe for consumption. The cashew tree (Anacardium occidentale) is a tropical evergreen tree that produces the cashew nut and the cashew apple. It can grow as high as 14 m (46 ft), but the dwarf cashew, growing up to 6 m (20 ft), has proved more profitable, with earlier maturity and higher yields. The cashew nut, often simply called a cashew, is widely consumed. It is eaten on its own, used in recipes, or processed into cashew cheese or cashew butter. The shell of the cashew seed yields derivatives that can be used in many applications from lubricants to paints. The cashew apple is a light reddish to yellow fruit, whose pulp can be processed into a sweet, astringent fruit drink or distilled into liquor. The species is originally native to northeastern Brazil. 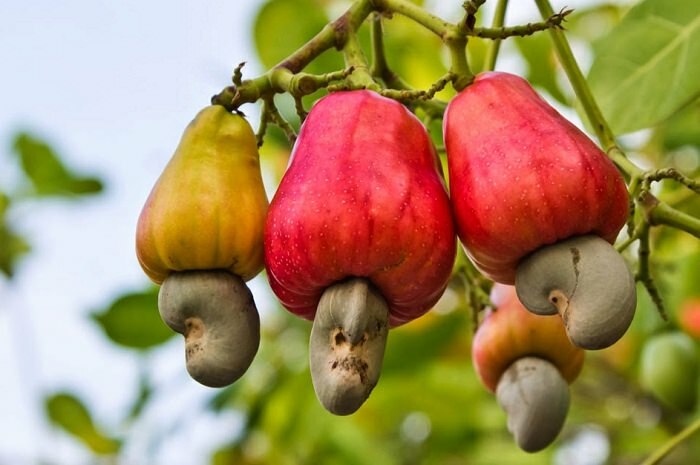 Major production of cashews occurs in Vietnam, Nigeria, India, and Ivory Coast.